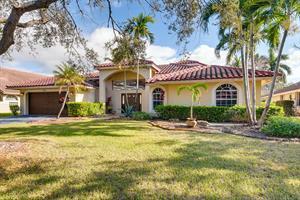 Nice 1 story home located in Jupiter Farms and close to all types of activities in northern Palm Beach County. Corner home built in 1989 with a nice glass front door that welcomes you to this nice home with vaulted veilings, 3 bedrooms, 2 baths, 2 car garage and over an acre of land with large front and back yards. Large screened porch and deck. Upgraded kitchen with granite counter tops, and snack bar next to a large family room. Master suite features sliding glass floors that exits to the screened porch.